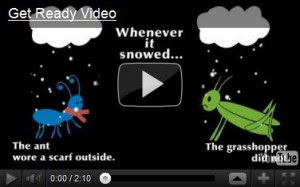 Watch the Get Ready campaign’s first-ever video that teaches the importance of emergency preparedness through a story about an ant and grasshopper. The grasshopper eventually learned from the ant and you can, too. Share this video with friends and family to help them prepare for all kinds of disasters, hazards and public health threats. To request a free DVD copy of the Get Ready Video, send us an email at getready@apha.org or call 202-777-2491. Multiple copies may be available, depending on supplies. Great to use at preparedness and educational events in your community!